Area Agency on Aging 1-B (AAA 1-B) is a non-profit organization that serves over half a million seniors, caregivers, and people with disabilities in Southeastern Michigan. They provide funding and management for government programs that aid the senior community in the area to live independently. AAA 1-B also partners with local organizations to provide a wide range of support services to the elderly and the disabled, such as help with yard cleanup and other chores. AAA 1-B needed a new look for their website that better told their story and had easy-to-understand navigation. They understood that a responsive design with clear calls to action would engage their users and create a more meaningful experience. Lastly, AAA 1-B wanted to better integrate content-oriented features, like blog posts and articles, into their site so that they could be promoted and shared. Because the AAA-1B team was accustomed to using the WordPress content management system (CMS), our team built the new on the same platform. The site navigation was one of the team’s biggest pain points with the old website. By enhancing the flow of navigation across the site, we could better communicate the client’s message, increase the amount of time a user spends on the site, and help users find relevant information faster. At the beginning of this project, we worked extensively with AAA 1-B to understand how a typical user interacts with the site and what the most sought-after web pages were. Our findings allowed us to determine the ideal order for the navigation and helped us create two interior page templates that featured a much smoother flow compared to the previous structure. In addition, we included several content block options on the homepage in order for users to be able to quickly navigate to the areas they wanted. For AAA 1-B’s new design, we created various options for the team to choose from. Once they chose a design, we did several rounds of revisions to ensure the design was exactly what our client wanted. We created a responsive website and ensured that their website functioned properly on desktops, mobile devices, and tablets. Attention was given to the forms on the page, making it easy for users to contact AAA 1-B. A short form is included on each landing page for quick questions and a longer form is included on the “Information and Assistance” page, where users can provide more information and request more specific help. Another goal of the project was to better integrate blog posts and social media into the website, so our team designed and programmed a blog for AAA 1-B. Additionally, we added social media icons to their website so that users had direct access to AAA 1-B’s social channels. 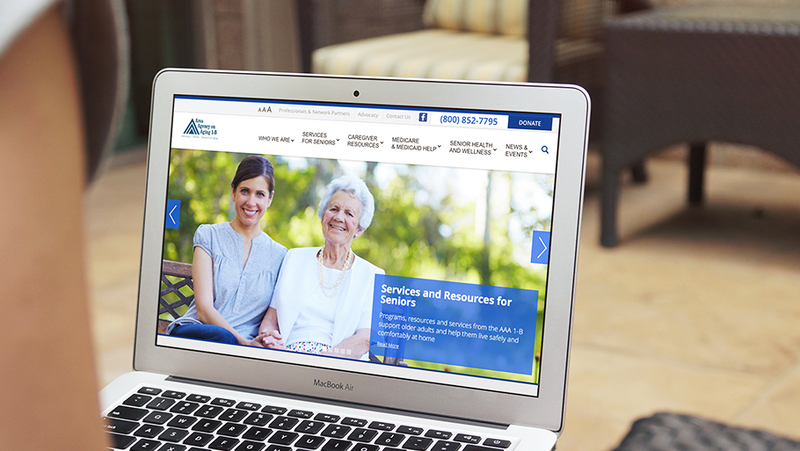 We also worked with AAA 1-B on two of their other sites: myride2, a senior transportation service, and Michigan Home Care Guide. We created these two sites and provide ongoing maintenance and necessary CMS updates for them. The logos of these sites are included on the AAA 1-B homepage so that site visitors have quick and easy access to these relevant resources. Lastly, we tested and reviewed every aspect of the website to guarantee that the launch would go smoothly. We also provided CMS training to our client so that they would be able to update content and add web pages whenever they wanted. The final result was a fully controllable website with a layout and design that invited visitors to engage and learn more about AAA 1-B.